There is an elegance we are told, in simplicity; in moderation. This, of course, is a lie. 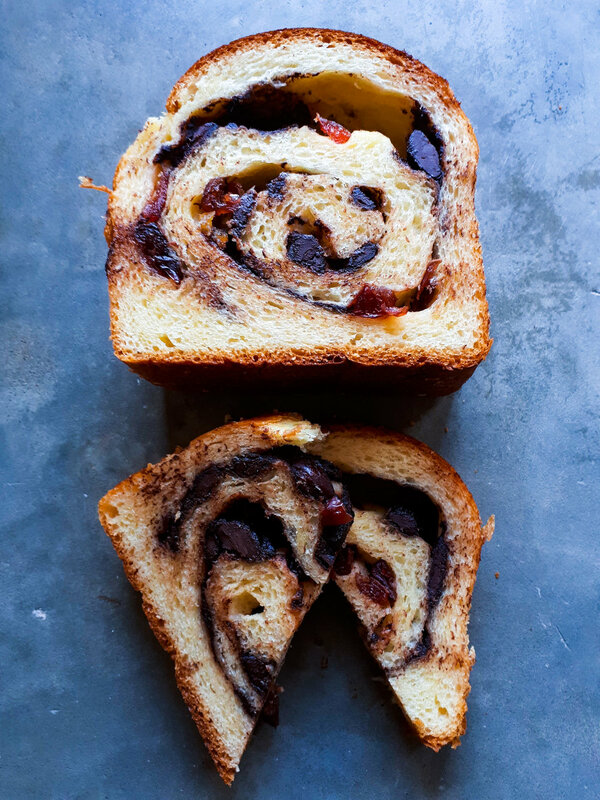 Our Dark Chocolate and Cranberry Brioche is a treat. Dark Chocolate pairs like it has been waiting all it’s life to: A Brioche au Chocolat, if you will. The slight bitterness of Dark Chocolate, the sour bites of cranberry meet the butteriness of the Brioche; becoming greater than the sum of it’s parts. Pairs well with: candles, moonlight, jazz and a few glasses of something special. Ingredients: Wheat Flour, Butter, Eggs, Sugar, Milk, Dark Chocolate, Cranberry, Salt, Baker’s Yeast. Storage: Keep in the paper bag, in a sealed box or ziplock bag for 1-2 days depending on how warm your environment is. Do not refrigerate or microwave. Slice, ziplock and freeze to store longer. Toast after defrosting. Rs. 1850/- *Includes Delivery Cost within Colombo 2-7.